Aleksandra Goryachkina, born in 1998, has just conquered her last norm for WGM title at the European Women Chess Championship. The young Russian girl finished at the amazing 40th place with 6,0/11, competing with a large number of GMs and IMs in what is considered to be the strongest EIWCC in history. With completing her WGM norm, Goryachkina becomes the youngest WGM in the world and gets very close to the record of youngest WGM in history World Champion Yifan Hou (12 years and 3 months). Alexandra Goryachkina is born September 28, 1998, in Russia. She first appeared as FIDE rated player in the October 2008 list with ELO of 1889, rapidly improving it to 2019 in the next rating list. Since then she stayed at relatively the same level, until she won her WFM title at the end of 2008- start of 2009 via the World Youth Chess Championships. That proved to be a game changer for her, she quickly set pace for a WIM title (approved at the 82nd FIDE Congress 15-22 October 2011, Krakow, Poland). Now only six months later Goryachkina is a proud owner of 3 WGM norms, soon to be approved as a WGM title. The WGM title comes as no surprise to the Chessdom readers, as Goryachkina has recently presented her fantastic form by winning the Lyudmila Rudenko Memorial. In her short career Goryachkina is winner of four important gold medals (U10 in World Youth Chess 2008 Vung Tau, U12 in European Youth Chess 2010 in Batumi, U14 in European Youth Chess in Albena, U14 in World Youth Chess 2011 in Caldas Novas), she has one silver (U12 European Youth Chess 2009 in Fermo), and one bronze (U12 World Youth Chess 2009 in Kemer). 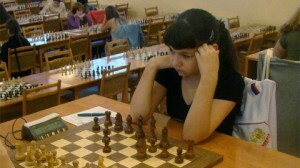 Goryachkina is rated 2341 at the March 2012 FIDE list, a rating that is expected to rise viewing her strong recent performance.